Last month, Shannon and I celebrated our anniversary. We planned an actual date night, Cameo brought home pizza and lemonade for her and the kids, and then they made peanut butter and chocolate cupcakes. Shannon and I went to eat with a gift card we had been given at Christmas and we went to a movie as well! I wanted to go to Aldi while we were in town, but he laughed and said that wasn't very 'date night-ish' and we didn't have time anyways. But we had a wonderful evening! 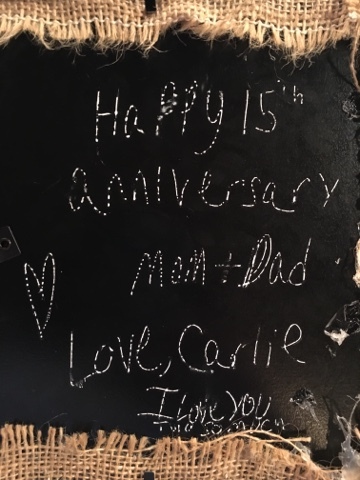 Carlie also wanted to make us a gift. She is such a thoughtful girl. 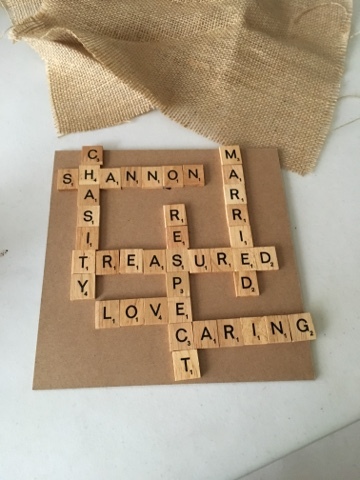 She knows my favorite game is scrabble. And she knows that we have our picture wall in the house. So she came up with an idea of this gift for us. 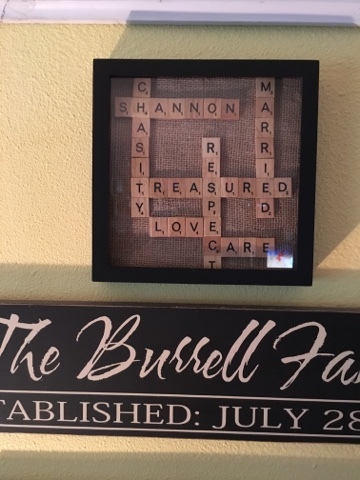 She took our names and some words (that she thought of, along with the placements of the words as well) and framed this collage for our wall. It was one of the most thoughtful gifts and we love how it looks.